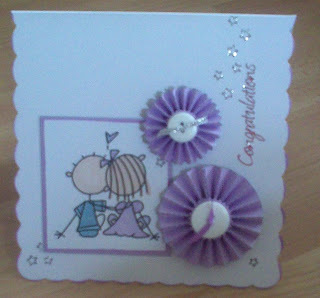 ...at Creative Craft World and their card challenge this fortnight, celebrating love, marriage and anniversaries, make a card which is suitable for these occasions. I have printed my image on digital cardstock which can be bought from CCW and to be honest Im terrible at shading/colouring with promarkers but with this cardstock it is fantastic and so easy! Quite difficult to show the shading on the picture but I am delighted with it. I have also used my new Tim Holtz rosette dies for the flowers and inked all edges of these in silver. To finish I have used a congratulations peel off with some stars. I love those rosettes - one of my favourite things to make at the moment.